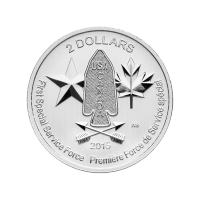 הפוך המילים "First Special Service Force Premiere Force de Service special 2 Dollars 2015" ותג הכתף של ה-FSSF, שני חצים, כוכב, ועלה אדר. המילים "First Special Service Force Premiere Force de Service special 2 Dollars 2015" ותג הכתף של ה-FSSF, שני חצים, כוכב, ועלה אדר. מטבע כסף Devil's Brigade שנת 2015 משקל חצי אונקיה This coin celebrates the the elite Canadian - American commando unit that operated during World War II. The Devil's Brigade was originally intended to be a parachute unit that would be dropped behind enemy lines to carry out sabotage missions. The unit ended up being used for reconnaissance and raiding missions. They operated from 1942 until December 1944 when they were disbanded. The unit used printed cards that they would leave on the bodies of enemy soldiers, "Das dicke Ende kommt noch!" or "The worst is yet to come!" printed in red ink down the right side as a form of psychological warfare. The reverse of this coin features the shoulder patch worn by the members of the unit, as well a star for the U.S. participation and a maple leaf to represent Canadian participation. Two arrows below the patch symbolize the warrior spirit. This is a rare fractional RCM issue featuring bullion pricing.